The cyclists are expected to raise more than $80,000 to support cutting-edge research and life-changing programs and services for people living with Multiple Sclerosis. 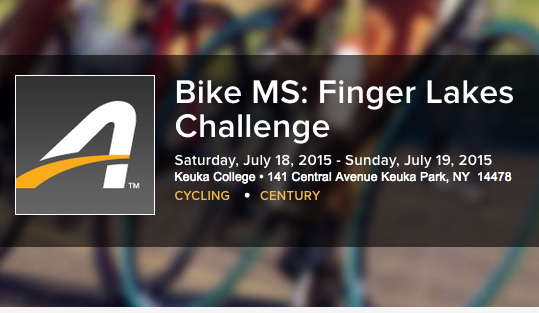 More than 120 cyclists will ride through the Finger Lakes region for an event called World Free of MS at Bike MS: Finger Lakes Challenge. The fundraiser will take place on July 18 and 19. The cyclists are expected to raise more than $80,000 to support cutting-edge research and life-changing programs and services for people living with Multiple Sclerosis, according to a release. The two-day cycling adventure headquartered at Keuka College has routes ranging from 25 to 100 miles. Bike MS, hosted by the National Multiple Sclerosis Society, is the premier fundraising cycling series in the U.S. for anyone seeking a personal challenge and a world free of multiple sclerosis. All participants have access to bike mechanics, support vehicles, 9 rest stops, a finish line celebration and much more. In upstate New York, more than 12,800 people are living with MS, an often disabling disease of the central nervous system that interrupts the flow of information within the brain, and between the brain and body. For more information, visit bikeMSupstateny.org, email Kerrie.Merz@nmss.org, or call 1-800-344-4867.